I got the new Formal Occasion Cricut cartridge and just had to play with it. 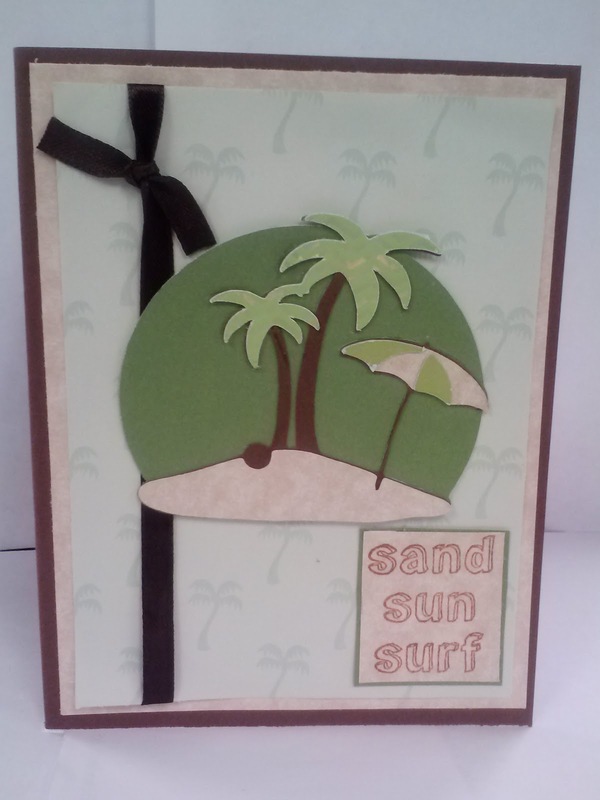 I created this fun card of a dream vacation spot. This cut is so cute, and I had the perfect background paper to go with it. I just added ribbon and a sentiment. The image has a lot of detail, so I left the rest of the card simple. I was able to use paper from my stash, and the ribbon was from a wedding favor. I just couldn't toss it, and I'm glad I got to reuse it on this project. Cute! Thanks for playing at Card Makin' Mamas! TOTALLY cute & Fun!Great Job! 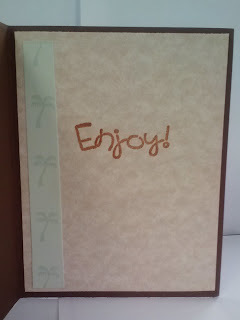 You're right - that patterned paper was just crying out for that palm tree cut! Adorable card! Thanks for joining us at Cut it Up Challenges! Thanks for joining us over at HIMCR. Lovely card to link up with us over at MSC. I could do with a spell under that tree right now. Fab card, I love all of the detail an your paper. Thank you for sharing your work with all of us at Crafty Boots Challenges. 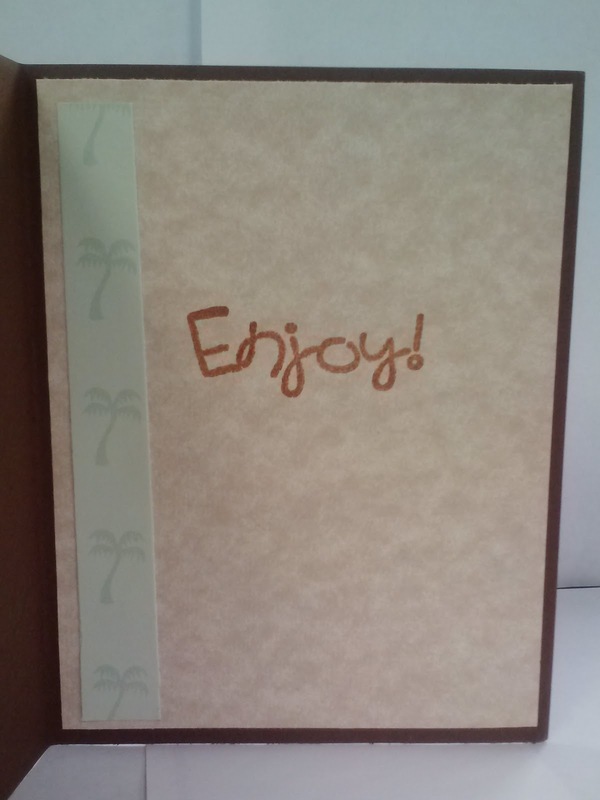 A fabulous card Evelyn, a lovely design and fabulous background papers for you!! Great card! I love the scene you created! It was a colder day here today. I'd love to be visiting your island right now. ;) Thanks for joining us for the Simon Says Stamp Challenge! 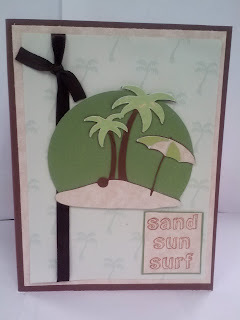 Super card, I really like that beach image!! Thanks for joining us at FCCB!! love how you used the "umbrella" in your card to play along with the 3 Girl Jam challenge!! I love how you did this card. Great layout, colors and papers. I just love palm trees. Sure glad you made this card...made me dream of going back to Mexico or Florida. Have an amazing week. 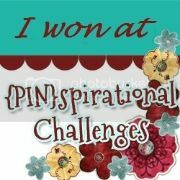 Thank you so much for sharing your awesome inspiration for us at 4 Crafty Chicks. so pretty. I love the ribbon. Thanks for joining us this week at Cut It Up! Thanks for playing our Tree Challenge at 4 Crafty Chicks! Great card and this does look like the perfect dream vacation. Love how your ribbon ties in with the trees. Thanks for joining us at Cut it Up Challenges! Thanks for sharing and linking this up over at the 3GJ challenge blog for our April Showers w/Ribbon Challenge :) We have a new challenge starting tomorrow so hope to see you play along again! The cute card is great,i used to buy spring ribbon for DIY.